Notices to the left of me, reminders to the right...! 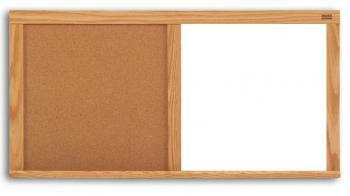 The Cork Dry Erase Board provides teachers with all of their message needs in one convenient board. On the left side of this two by three foot message board is natural, recycled cork that possesses the resiliency to withstand years of tack impressions. Put all of the important, longstanding school and classroom notices on the bounce back cork surface. 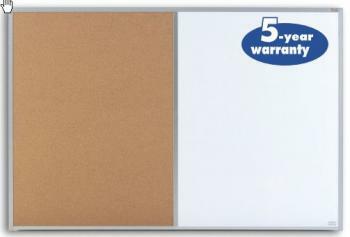 The right half of Cork Dry Erase Board contains the highly durable porcelain steel dry erase board. All of your changing classroom reminders, such as upcoming tests and field trips, can be written on the easy to erase melamine surface. 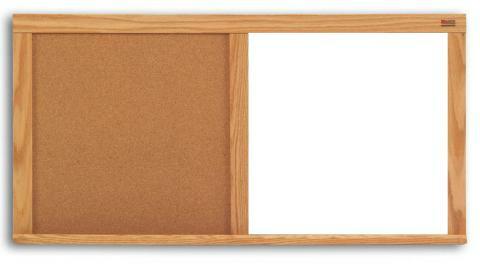 Order this multi-purpose board with either solid oak or anodized aluminum trim and take advantage of the full-length shelf tray to store your tacks and dry erase markers. Do not use this board on damp walls or areas of high humidity.